What will 2017 bring for internal communication? What would be your greatest hope for the internal communication profession for the year 2017? This year, I have had the fortune to work with some excellent communication practitioners. Through IABC and CEB I have also met IC leaders from a range of industries. Common to many of the conversations have been two opposing ideas: we need to manage new challenges facing the world of work, and we still need to improve our core practice. I thought about how the past year has presented new challenges for communication. Life in organisations requires us to continue to adapt. At the intersection of the technological, social, and geopolitical shifts of 2016 is a revolution in work. The World Economic Forum describe this as the Fourth Industrial Revolution. In the face of these factors, how do communicators look forward, when so much time is spent in the trenches where the battles of value creation, tactical execution, and the push for strategic influence are fought. My hope for our profession in 2017 is that we develop our practices in ways that contribute: creating connections, cutting through complexity, and growing empathy. The breadth of responses from communicators including Shel Holtz, Claire Watson, Jim Shaffer, Liam Fitzpatrick and Rachel Miller provides an optimistic take on how we tackle the big picture and the detail of our practice in the new year. It’s comms conference season, and that means the internet will be abuzz with 140 character insights from a range of events. There are exciting – and challenging – emerging trends and new insights. We will see that in abundance at the excellent #IABC16 this week as the worlds leading communication membership association gathers around the theme of innovating global communication. When you have been fortunate to have attended, chaired, co-curated and presented at a fair range of communication conferences and events*, you do start to see patterns in terms of insights and learnings. These recurring insights form a kind of communicators BINGO! If we are to judge the progress of our profession by the wisdom shared on twitter from many comms events, then it seems we are caught in a loop. Yes, communication events do attract emerging practitioners. But seeing foundation knowledge shared as revelations does raise some questions about how effectively we are preparing communicators for professional practice. If we are to continue to develop, to grow our collective commons and body of knowledge, we need to keep pushing for deeper insights, evolve our discussions and move beyond the foundations through research, education and creating connection. Oh, and if you have any other #commsbingo insights, please tweet them so we can collate the common knowledge. *I have been a past chair and co-curator of Melcrum Strategic Communication & Digital Communication Summits in Asia Pacific, presented at the 2014 IABC WC in Toronto, and have been involved in communication professional development since before twitter was invented. Learn more about the Shorter COMMS Plan in this free webinar. Technology has changed the way we consume information outside organisations, and it is natural that we want the same choices within. Companies that incorporate channel choice in their communication mix will win the war for engagement. Find out the seven ways you can improve the choices for employee communication channels in this presentation. For more information, see the article Changing channels: why employees demand freedom of information choice on LinkedIn Pulse. One of the greatest challenges for employee communication in any organisation is information overload. A consistent theme from communication research is that often in organisations there is too much of the wrong information. Line managers and employees in many organisations struggle with complexity. What has led to this situation? Change. Changes to processes, products and procedures. Changes to the markets that companies operate in. Changes to regulations. Customer expectations. Social and political change. Technology. Technology. Technology. Against this background, asking employees to focus on ‘another thing’ can be a challenge. In addition to the number one rule for employee communication* there are three things organisations can do to ensure the CSR&S initiatives achieve the outcomes they need to for the company and its stakeholders (including employees). *The number one rule is ‘make it relevant, make it simple’. Provide the ‘why’ for your whole CSR program in a consistent way. Many CSR&S strategies are comprehensive documents that run to many pages, are produced, launched and then fall stagnant until the next reporting period. For CSR&S to come to life, a clear narrative is required that is reinforced consistently through leadership communication, as well as in other channels. If CSR&S is not a key strategic focus for a company, it is essential for leaders to find ways to incorporate it. support for leading practice labour and OHS programs. Individually, not all employees will be impacted in the same way by these initiatives. Expecting the whole of firm to be across every aspect when it is not their core business has a potential to feed the information overload and reduce engagement. Our business strategy recognises the benefits of a comprehensive approach to CSR. The outcomes of this strategic approach will include financial benefits, reputational benefits with clients and opportunities for employee development. Individual projects or changes can be communicated in the most effective way according to the type of change outcomes, the audiences, and the available channels. 2. Be clear about what ‘engagement’ with CSR programs looks like. Define ‘what’ people need to do differently. Traditionally, employee communication has focused on the hearts and minds of employees, getting people to ‘buy in’ to changes or initiatives. An increasing body of research shows that getting people to take an action is more powerful at shaping their perceptions. Instead of ‘think, feel, do’, it is more effective to get people to ‘do, feel, think’. In order for employees to engage with CSR&S initiatives, it is essential to be clear about what that engagement looks like. What will people be doing? How is that different to today? Many ‘communication problems’ are actually process issues. With smart process design, sometimes communication is barely necessary. Make it easier for employees to take the actions required. Make the ‘how’ intuitive and simple to do. Well-designed processes, procedures, systems and tools reduce the volume of communication needed. There is no training manual for how we use a social media tool such as Facebook, or our smart phones or the motor registry queue. In the best cases, taking the necessary action ‘just makes sense’. Originally focused on online channels, increasingly, user experience (UX) or customer experience (CX) design methods are being used as part other kinds of change. Operational instructions are just in time, rather than relying on people knowing how to do something just in case. Unless CSR is treated strategically, there is a risk that communication about initiatives, processes and programs will get lost in the competition for a share of employee attention. Addressing some types of CSR&S efforts require organisations to rethink their operations at a broader scale. Communication can go part of the way. Without visible, sleeves-rolled-up leadership, the best communication program cannot sustainably embed CSR into everyday activities. Being clear about what people will do differently by adopting new CSR programs and processes helps communication be clear, targeted, and enable action. Better process design will make it easier for employees to take action with CSR programs, allowing for a focus on the big picture messages about the benefits of better CSR. Topical, light-hearted and listicle friendly. That is why Back to the Future Day has given the whole content marketing tribe a little shot of Pepsi and a jolt of lightning. Aside from the ‘what they got right and wrong about the future’ trope that has even the scientist-communicators on board, it is an opportunity for reflection on what has changed in culture – and in specific industries – since then. Communicators and marketers are no exception. Here are three #bttfd pieces that are worth your travel time. An early contender, Rachel Miller came out strong with a piece on timeless advice for communication professionals. The future may not be here as it was imagined in the films, but I think it’s an exciting time to be working in the field of communication and be interested in all things technology related. Trust is the currency of communication. There’s no such thing as purely ‘internal’ communication. Don’t view communication as something you do to employees, but for and with them. The role of professional communicators has shifted from content creatorsto content curators. Work is a thing you do, not a place you go. See her full article for more advice. B and T have taken the opportunity to look at the marketing efforts around the date, including the emphasis on digital, and the need to develop marketer’s skills in a changing world, through a guest post from ADMA CEO, Jodie Sangster. Read the full piece at B&T. And rather than looking back, The Conversation has invited some of the brightest future focussed researchers, thinkers and academics to consider what will things look like in 30 years time. A thought-provoking read at the intersection of speculation and technological progress. Applying the Kotter eight-step model indiscriminately to project-level initiatives and operational change leads to challenges. Generating a ‘sense of urgency’ for mid-level changes creates unnecessary competition for share of mind. In a typical large organisation undergoing transformation, there are likely to be dozens of project-level initiatives and concurrent operational change. There is a paradox. 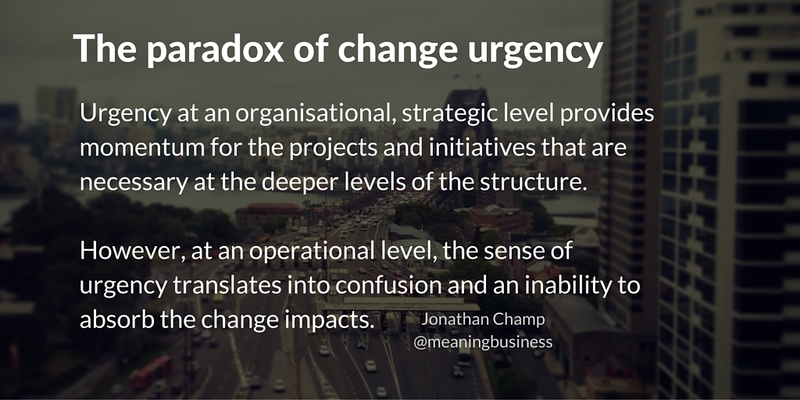 Urgency at an organisational, strategic level provides momentum for the projects and initiatives that are necessary at the deeper levels of the structure. However, at an operational level, the sense of urgency translates into confusion and an inability to absorb the change impacts. The underlying need for change at the project or operational level needs to be rolled up to the overall strategic imperative. Creating urgency around the detail of the change creates noise. This manifests itself as an increased request for project branding, change-specific communication channels. Consider the broader world beyond organisational life. As citizens and consumers, we conduct all kinds of complex behaviours and transactions ‘online’. The online environment changes constantly. Yet there is no change management plan for ‘the internet.’ Methodologies such at UX and User-Centered Design ensure that (successful) apps or sites or technologies are intuitive and based on making action easy to complete. These disciplines do not apply only to online and technological change. The ability to design the ‘pointy end’ of change within organisations in a way that enables action at the right time without requiring substantial training or commitment becomes an opportunity for making continual concurrent change something that is easy to digest. As Bill Quirke writes in Making the Connections, “Organisations are short changing themselves by not seeing communication through to the end – converting awareness into action. The real value of internal communication is to help business ends by enabling employees to turn strategy into action” (Quirke, 2008). This is an excerpt from my chapter Kotter in context: is the classic change model damaging your mid-size change? 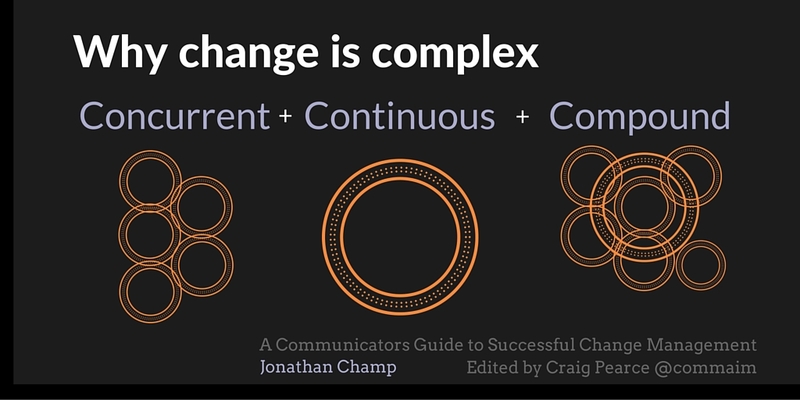 in A Communicator’s Guide to Successful Change Management, edited by Craig Pearce. Writing in Accelerate/XLR8 (2014), Kotter recognised complexity and the shifts in organisational structure and networks, and the need for agile methods of mobilising people within the organisation. In practice, change at the project level has three qualities that can complicate the effective management and delivery of benefits or the desired outcomes. Concurrent – there are seldom single projects underway in an organisation. Depending on the degree of internal organisation and prioritisation, these initiatives may or may not be coordinated. out. There is no fixed future state, only a series of iterations. The idea of ‘versions’ of the future state is a powerful metaphor for this: change version X.X. Compound – change impacts from one initiative have flow-on implications for other initiatives. When delivered top-down, the aggregate compound impact of change can be miscalculated. This can be an overestimation of the ability to absorb change at an individual level, or it can be a failure to calculate capacity for the impacts of accumulated incremental change. In the most effective organisations there is coordination of impacts across the range of concurrent projects. There is strategic value in effective governance that provides alignment of the intention of transformation with the operational reality of the ‘current state’ organisation. This is an excerpt from my chapter Kotter in context: is the classic change model damaging your mid-size change? in A Communicator’s Guide to Successful Change Management, edited by Craig Pearce, a free resource packed with user-friendly and functional insights and advice on how communication contributes to effective change management. This post first appeared on LinkedIn Pulse.